This cuvee is 100% Gewürztraminer sourced from Jim Clendenen’s own Le Bon Climat Vineyard planted in 1998 in the Santa Maria Valley. Located on the southern border of the Santa Maria Valley overlooking the Santa Maria River, the cool Pacific Ocean air runs right up the valley to Le Bon Climat. The grapes were hand harvested and sorted in the vineyard. Le Bon Climat is only five miles from the winery, so the freshly picked grapes were pressed shortly after picked. CELLAR The fruit is barrel fermented in neutral French oak, matured surlies, and completes malo. Aged 6 months in barrel. 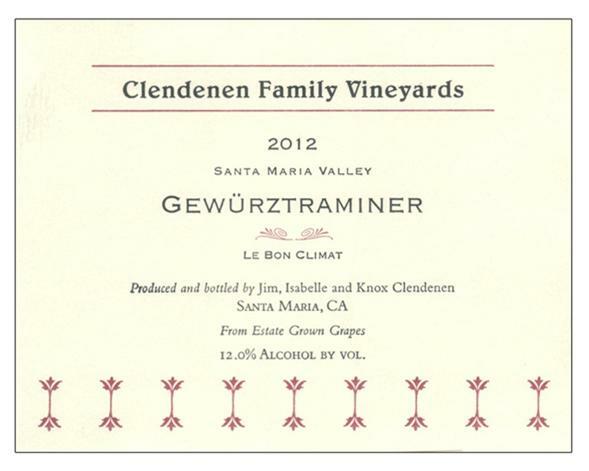 Jim Clendenen chose to allow the Gewürztraminer fruit from his estate vineyard to express itself in a bone-dry style that is Alsatian in nature.